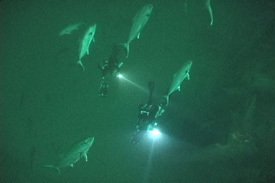 The E.M. Clark was a five hundred foot long oil tanker bound for New York with heating oil at the start of World War II. 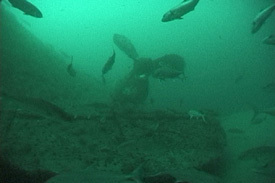 As she passed Cape Hatteras, North Carolina on March 18, 1942 she was torpedoed by the German U-boat U-124. 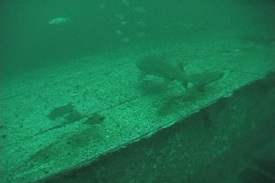 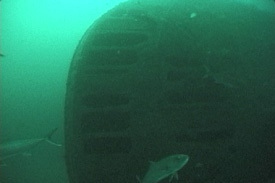 Resting on her port side in 250 fsw, she is a most impressive wreck and home to the Cape’s many sand tiger sharks. 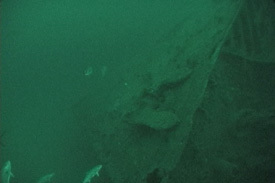 (l) Bow of the E. M. Clark ; (r) Starboard anchor. 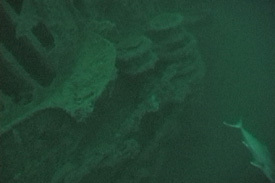 (l) Anchor windlass and chains; (r) Joe & Barney scooter the wreck. 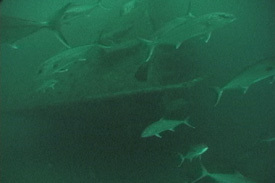 (l) Sand tiger sharks on the starboard hull ; (r) Rudder. 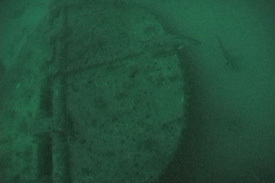 (l) Starboard screw; (r) Stern of the E.M. Clark.